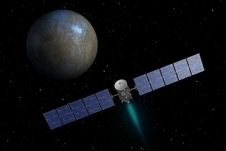 This artist’s conception shows the Dawn spacecraft approaching Ceres. Courtesy NASA/Jet Propulsion Laboratory. The Dawn spacecraft, after more than seven years in space, has entered the final phase of its trek to Ceres. NASA said Wednesday that Dawn is now about 640,000 kilometers from the dwarf planet and is expected to arrive in orbit on March 6. Ceres is the largest object in the asteroid belt, with an average diameter of about 950 kilometers. Dawn’s visit to Ceres will make it the first spacecraft ever to orbit two different celestial objects. The probe also orbited the protoplanet Vesta in 2011-2012. Although discovered more than 200 years ago, scientists know little about Ceres. The closest dwarf planet to Earth, it may have both an ocean and an atmosphere. Ceres is so cold that water would sublimate if it wre on the surface. NASA launched Dawn into space on Sept. 27, 2007. Scientists have discovered water vapor on Ceres, a dwarf planet and the largest object in the asteroid belt. Using the European Space Agency’s Herschel space telescope, researchers detected a spectral signature of the substance on four occasions. “This is the first time water vapor has been unequivocally detected on Ceres or any other object in the asteroid belt and provides proof that Ceres has an icy surface and an atmosphere,” Michael Kueppers, a planetary scientist at ESA and the lead author of a paper documenting the discovery, said. Ceres is an ice-covered object. One way the water vapor could have formed is through the melting of that ice as Ceres moves closer to the sun during its orbit. Parker said that the other possible mechanism for melting Ceres’ ice could be cryo-volcanism. Cryovolcanos occur on frozen celestial objects and involve the eruption of volatile compounds, including water, in plumes. Kueppers and his fellow researchers concluded that the ice melt scenario is more likely correct. It will not be necessary to wait long for a conclusive determination about whether their conclusion is the right one. NASA’s Dawn probe is in the asteroid belt and is scheduled to arrive at Ceres next spring. The spacecraft has on board both a visible and infrared mapping spectrometer and a gamma ray and neutron detector. Scientists have long been confident that Ceres is shrouded in ice. Spectroscopic observations of the dwarf planet have indicated that it has a silicate core. Since the total density of Ceres and the assumed density of the silicate core can be calculated, Ceres’ mantle must be composed of several tens of kilometers of ice. “We always expected Ceres to be a wet body because of its low density,” Russell said. Kueppers and his colleagues detected a huge amount of water vapor sublimating from Ceres. About one octillion molecules of the compound are moving into space each second. They appear to emanate from the dwarf planet’s mid-latitudes. Ceres was discovered by the Italian astronomer Giuseppe Piazzi on Jan. 1, 1801. It was initially thought to be a planet with an orbit that lay between Mars and Jupiter, but soon after its discovery was deemed an asteroid. It was reclassified as a dwarf planet in 2006 because of its 950 kilometer diameter, large for an asteroid belt object. The paper appears in the Jan. 23 edition of Nature. 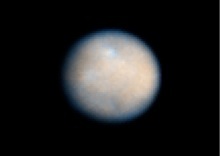 This image of Ceres was obtained by the Hubble Space Telescope on Jan. 1, 2004. Image courtesy NASA, European Space Agency, Southwest Research Institute, Cornell University, University of Maryland, and Space Telescope Science Institute.